Light rail plans are progressing fast, which got me thinking about the different options for doing ticketing for these services. First off I think it is likely the service will have to either not accept cash fares or will need to provide ticket machines at all Light Rail stations. This is because I doubt the driver will be easily accessible to passengers like a bus is. In fact I often wonder if making it easier to get a HOP card, or allowing contactless card payment and moving away from cash fares in general, would be a good thing. Similar to a bus, passengers would tag on/off as you board/alight the service. This is what Melbourne does with two Myki readers for each door, however, I believe you are encouraged to not tag off as all trams are within zone one and thus the fare will be deducted whenever you tag onto your next service which speeds up dwell times. Since our system will cover more than one zone if done this way it is likely that we would have to tag off meaning longer dwell times than Melbourne due to slower alighting. However, it would be great if HOP did just remember your last tag on and deduct whenever instead of charging a penalty if you forget. The advantages of this system are it is very cheap and easy to understand but will probably result in longer dwell times. This would be similar to how our train network works with tag posts at each station platform or potentially at some stations gates. The key with this will be making sure, unlike the current train network we are not stingy with the number of tag posts as this will slow everything down. The downside of this option is that especially if not enough tag posts the platforms could become crowded reducing amenity as well as safety. It could also result in people missing the service because a large line of people trying to tag on. Personally, I am more partial to platform based ticketing, but what do you think? Platform. Gives LRT some of the attributes of a connected network rather than seeing each LRV as a substitute bus. Having enough of posts should be a no-brainer. They can be either on the platform as on the way in/out. I remember from Hong Kong a very simple setup that would have a line of the devices on both sides of the paths leading to platforms. Why restrict posts to just one direction? If there are few people needing to tag-off but a whole lot of people arrive wanting to tag-on, then wouldn’t it be better to have all tag posts available for those that want to tag-on? To manage the flows of people. If memory serves right, the tag-on posts where on the left side of the walkway, tag-off one on the right one, so with large volumes moving in and out that worked quite well (i.e. people were not bumping into each other when trying to tag on/off). Platform tag-ons please, please, please. So much easier, and you can add extra anytime for busy stations. Taking cash away as an option would be preferable, but I suspect AT and Council will baulk at this. The savings in travel time to free up more vehicles and capacity would be enormous. You can probably get another 2-3 services in peak hours from doing this on high frequency routes. The next few years would be a great time to trial routes with these ‘card only’ services to build the case that the travelling public can cope without cash. I wonder if we will see innovation? Should we expect staff at stations? In which case maybe the cash option can be accommodated by people buying the fare from staff at the station. This wouldn’t slow the people using cards down but still allows for people who left their cards at home or who can only cope day-to-day. It would be slower than using a card, so maybe that’s incentive enough to get a card, and the big differential between cash and card wouldn’t be needed. Very unlikely I think. With 30 something new stops on the two lines operating 120 hours a week, that’s about 200 people you’d need on the payroll just selling tickets. What’s wrong with a ticket machine at each stop like the other trains? Nothing. Having a vague moment, sorry. Agreed, platform is best especially since it gets rid of the problem of people trying to tag off through the crowd at the doorways. I doubt AT/Council will ditch cash but at least where services are street running we could put the ticketing machines outside the stations (on an adjacent footpath, perhaps) to avoid conflicting movements between people buying tickets/topping up (dis) embarking passengers. Maybe like the ones I used in Germany many years ago- I kind of vending machine where you could buy a one time use ticket or multi ticket – or in our case where you could even buy a HOP card. Platforms with sufficient readers have no downsides, so it’s a no-brainer to choose this option. All three… Tag readers on trams and platforms. Ticket machines on trams and the busier stops. If you get on a tram without a ticket you are allowed to travel next to the ticket machine but not anywhere else on the tram. Let’s call it the White Zone. Wouldnt that mean i could get a free ride if i just wanted to pop down the road? Having tag readers on both seems pointless and confusing. And ticket machines on the trains would take up lots of room and create an annoying pinch point. Considering there are only going to be 22 stations on the City to Mangere line (and probably fewer on the North Western line), I don’t see why we can’t have ticket machines at every station. I agree. The cost of the card readers has come down a lot, so this option is feasible. Place the obligation on people to have tagged on while they are riding, and then they can either do it before they enter or once aboard. Simple tag readers do not take up much room. The really important step is to make sure that the fare system and ticketing is integrated with the rest of the AT system. Platform card readers would make it easier for passengers, and be a similar experience to the current rail stations. With card readers on the vehicle there’s a strong likelihood of a hold up caused by a “door scrum” of people getting on and off all trying to use the same readers, much like you sometimes see at present on buses when passengers get off from the front door. The G:link light rail system on the Gold Coast has ticket machines on each platform (2 machines if it’s an island platform). Much like the AT ticket machines the TransLink ticket machines let you top up your Go Card (the equivalent of the AT HOP card), purchase cash fares, but unlike the AT ticket machines you can also purchase a new Go Card. Wouldn’t it be great if the AT ticket machines had the ability to sell AT HOP cards? Platform tagging is fine provided, like you say, there are enough terminals. At the current Ranui train station for instance there is only a single terminal which is ridiculous. Not only should platform based tag readers be used, but all stations what are not on street running sections (everything south of Mt Roskill) should be gated. That would be a waste of money given that the busiest station on the network on Queen St won’t be able to be gated easily. Better to spend the money on enforcement across the network. A street running LRT system with low floor LRVs should not need to do that, and it would lose a lot of the urban amenity improvement value in places like Queen Street. Better to give people multiple options and have roving inspectors on board a sample of LRVs. Graham Currie (Monash Uni) has done research on this. Look up articles on fare revenue protection by him. None of the stations mentioned are on street running lrt. No amenity lost. I’d love to see long RFID based tech (or similar). I shouldn’t need to physically tag on or off. As I walk in the door, it tags me on, as I leave the door it tags me off again. Easy. Why not just tag on by pressing a button on the AT app on your phone (or have the app track you which will use battery), then it can tag you off automatically using GPS. Is any country doing this? Surely its the cheapest possible solution to ticketing. Great for tourists too – just need to download the app and give it your CC details. Oslo too and unbelievably it’s PT is cheaper then London and Auckland. PLUS they have two different fast trains to the airport. Easily the easiest PT to use I’ve found in the 60+ countries I’ve visited. If only Auckland had HR too, especially for people living south or east of the airport which no tram from the CBD will sort anytime soon. There are still people who do not have smart phones and can’t afford the data that would be needed to use one. So great as one option as long as it isn’t the only option. It Oslo it shows that you’ve have brought a ticket, all you need is connect to buy and you can buy single trip, weekly or monthly trips as needed. I can buy a ticket today in London to use for a day in Oslo next week so data is not a problem. They still have normal tickets for those who do not have modern mobile phones. Thanks Martin. What sort of difference in price is there in Oslo between cash and electronic tickets? And when your phone goes flat? Maybe as well as platform tagging it would be a good option. If the readership really want to influence such things, they need to make a time with the NZTA Light Rail team pretty quickly. As we saw from the NZSuperfund/Quebec proposal, the proposers are going to come in with a fully integrated package with neither time, scope, nor will to start customising specific parts of the system. The bigger question at play is the future of HOP itself, since it has run foul of rules governing credit cards. There is no point in a country having multiple PT ticketing systems. There should be one, operating nationwide. And it should be able to book me on to public parking buildings, and regional rail (in time) as well. At 5 million people that’s not a huge ask. Gawd. If this “off the shelf system” doesn’t support HOP, now that it FINALLY, works across transport mediums there’ll be hell to pay!! I’d be very surprised if the LR network has a different ticketing system to the rest of the network, whether that be HOP or any future system that replaces it. It would set PT in Auckland back years by having separate ticketing systems. Platform for sure provided there is plenty of tagging points. Busy stations should have 4 tagging posts on each platform that can accept HOP and Paywave. I also think that there should be a dispenser that prints out tickets that can also get scanned by the tagging posts. Some people would abuse the system though by not tagging on but that can be avoided slapping massive fines on people that skip their payments more than twice. There will be only a limited number of platforms compared with LRT doors. Ground based should be a cheaper and easier system to implement. c) you tag off only if your journey is entirely in zone 2, since that fare is cheaper than a zone 1 or zone 1+2 fare, and this applies just at the extremities of the longest routes. None of this will apply in Auckland, so off-vehicle tagging is the way to go. Platform, has to be platform. This touch will also help to convince the public that this is rapid transit. Trains whether heavy or light should be platform. Lots of tag posts and yes card/cash ticket dispensers on the platforms too. Probably at least two on the busy city stations. Often one is out of order anyway with similar machines like parking ones. Definitely card/cash ticket dispensers.since it’s an airport line, travelers are not going to necessarily buy a hop card. They just want to buy a single ride. And they should be able to use their contactless bank cards, as in London, for example – no equipment beyond the card readers required. Next Light Rail article, can you please discussed the possible platform design. Is it possible to have majority, if not all station, built as island platform compared to separate multiple platforms like the gold coast example? 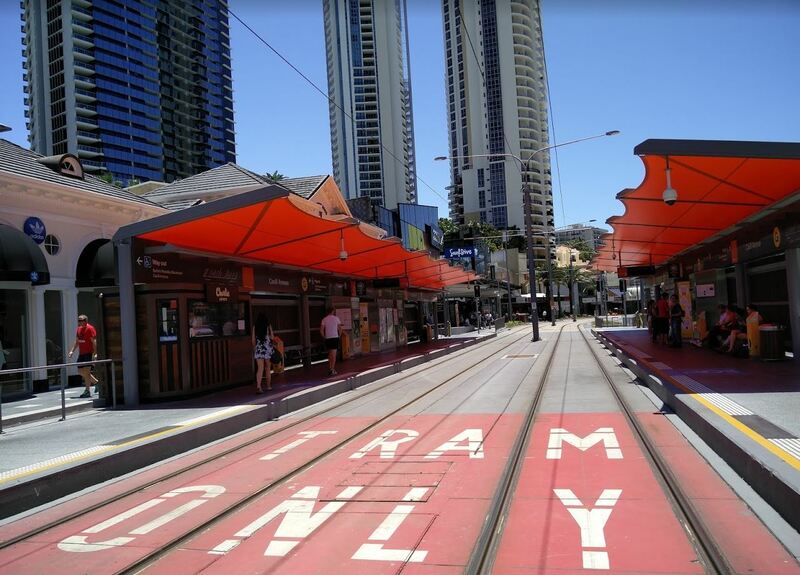 The question to ask is…are trams more like buses or more like trains? And there you have the answer. They run on tracks, and carry hundreds of people, so they are train-like. PLATFORM! In Auckland, tag off should not be penalised for transfer. That improves dwell time. Also should be an array of multiple tag machines every 10 metres in the platform, as well as on every door, both sides of the vehicle doors.